The PowerVault 124T is a tape autoloader that allows customers to maximize their rack-based storage backup within a 2U chassis. Its expandable architecture and magazine design enable customers to quickly manage and replace tape cartridges for growing data center needs. These features also help customers cost-effectively scale capacity to meet future backup and recovery demands. 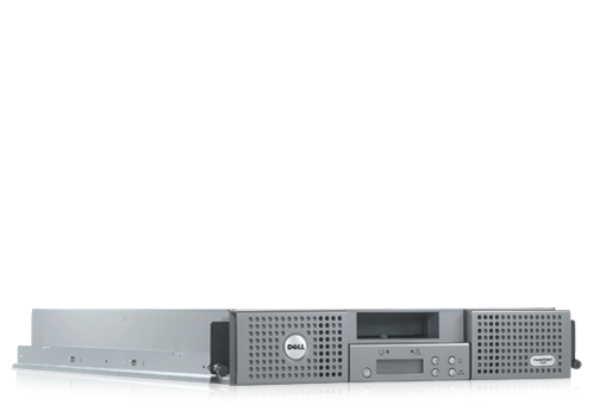 The PowerVault 124T delivers reliable backup through remote management using any web-based browser while featuring seamless integration into diverse operating systems such as Microsoft® Windows and Linux®. When factoring in the features and benefits of tape storage — such as reliability, portability, encryption (LTO-4, LTO-5 and LTO-6), and the shelf life (over 30 years) of tape cartridges — it is the perfect solution for your long-term or short-term backup or archiving needs. In addition, when tape media is stored, it does not require energy until it needs to be accessed. By using zero energy when stored, tape is "naturally" Green.